On December 13, 1944, a kamikaze aircraft carrying a bomb under each wing crashed into the deck of light cruiser USS Nashville (CL43) with both bombs exploding. 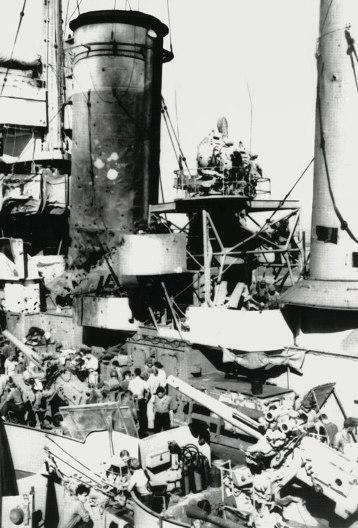 The kamikaze attack and resulting fires killed 133 and wounded 190, and the serious damage required the ship to return to the States for repairs and forced the ship out of the war in the western Pacific until May 1945. Steven George Bustin, whose father served as gunner's mate for three and a half years on the ship, has written a fine history that skillfully weaves the high points of Nashville's history from official naval documents and the personal stories of men who served aboard her during her US Navy service from her commissioning (June 1938) to her designation for disposal as surplus (March 1946). This ship history displays the thoroughness of Bustin's research, who mentions at the beginning of the book that it was "an endeavor of 98% research and 2% writing." The book has a ten-page bibliography and listing of other sources, but unfortunately it lacks an index to quickly locate the numerous men and places mentioned. Historical photos of the ship and crew totaling 35 pages are displayed throughout the book. 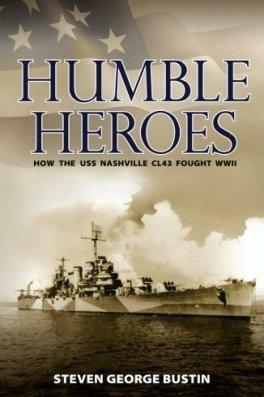 The book's ten chapters cover Nashville's history in chronological order, but the author does not try to cover every single event in the ship's history but rather selects the most significant ones. The numerous crewmember eyewitness accounts make the history come alive and provide humor. Nashville had a distinguished history in WWII. Highlights include participating in the Doolittle B-25 bomber air raid on Tokyo in April 1942, cruising the north Pacific to defend Alaska and the Aleutian Islands from May to November 1942, shelling various Japanese-held Pacific islands in 1943 and 1944, serving frequently as flagship for General Douglas MacArthur including during his return to the Philippines, and fighting off 90 air attacks over 40 days in the Philippines between late October and early December 1944. Before the devastating kamikaze attack, Nashville had a couple of close calls. On June 4, 1944, a bomb dropped by a Japanese aircraft exploded next to the ship resulting in no casualties but causing moderate damage that took about one month to repair before she returned to battle. On October 26, 1944, a Japanese torpedo bomber released a torpedo that missed less than 15 yards off Nashville's stern. GM3c Alfonso Garcia Vejar had just left his station as he was relieved and went below deck to eat. The man that took his place was killed instantly. Alfonso was alive by sheer chance and fate. The Japanese reported several times that Nashville had been sunk, but the light cruiser survived through the end of the war. After Puget Sound Navy Yard workers repaired Nashville's kamikaze damage, the ship returned to the western Pacific in May 1945 and spent the final months of the war primarily supporting operations in Borneo. In 1951, the US Navy transferred the ship to the Chilean Navy, who used her until finally sold for scrap in 1983. The book contains just a few typos and misspellings, such as McArthur instead of MacArthur and Yamato instead of Yamamoto. The description of the end of the war has an incorrect statement that all of the eight kamikaze planes led by Vice Admiral Ugaki were shot down (p. 166), but actually it is not known what happened to them, and it is likely that most or all of them crashed into the sea without finding any American ships during their nighttime flight. All of them were in danger at various times and all of them saw the grotesqueness of death during war. Many displayed stunning acts of heroism in defense of their ship and the care of their shipmates. Yet never once during hundreds of conversations did I hear a boastful remark from a crew member in regards to his role and actions. They were proud and boastful about the ship and their crewmates, never about themselves. They truly were, and are, humble heroes.